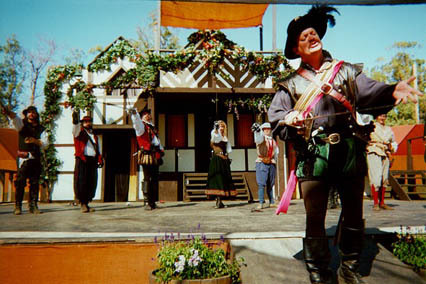 We perform at major Renaissance Faires and events. Our shows include dazzling displays of wit and swordplay. Ok, perhaps I’ve overstated it just a bit, but we like them. We have produced thatrical action, comedy and drama, including The Deadly Game, The History of the Sword, Manly Men in Tights, Shakespeare’s Bloody Bits, Robin Hood: Prince of Leaves, The Three Musketeers, All’s Well That Ends Badly, and many more. We also perform street shows, hearty displays of dueling, and thoughtful training in historical fencing.